Quiz – Do you Moon Phase? Examine this image of Moon phases made from emojis. Reading left to right, which row shows the correct sequence of Moon phases? Row 3 is the correct answer. Row 1 is almost correct except for one Moon phase. A Strange but True FACT … the Moon – when viewed from the Southern Hemisphere – goes through the same phases but upside down! 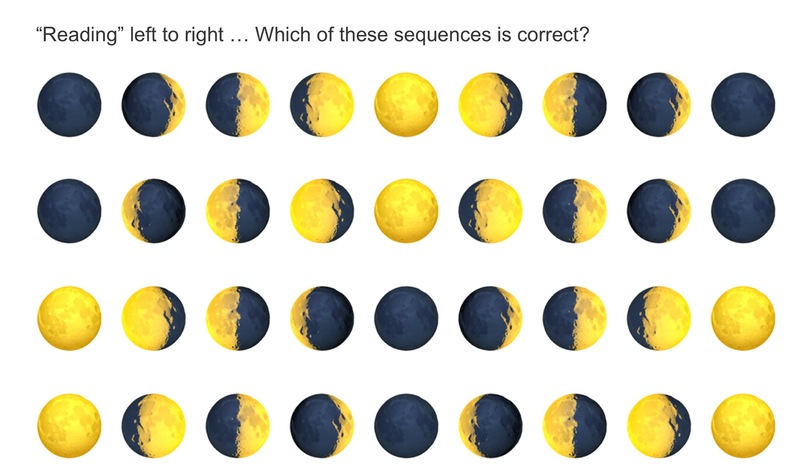 So, Row 3 is correct but only if you flip the quiz upside down and then read the sequence right to left. Copy this list of moon emojis and send to your friends.